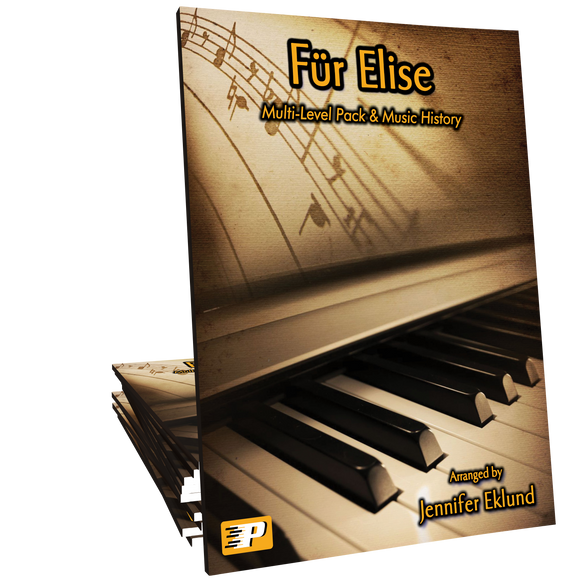 Fur Elise educational pack features seven unique arrangements of this piano favorite, including two duets, at various levels. 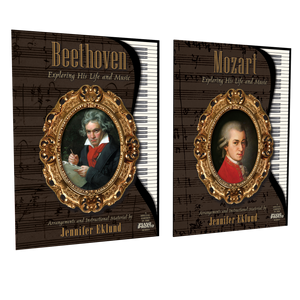 Includes biography of Beethoven and music history page with the background information about this perennial favorites. 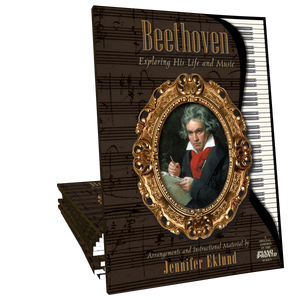 Arrangements and instructional material by Jennifer Eklund. Fur Elise is one of those pieces every student wants to play, but teachers often lose students before they can actually play Beethoven’s version. Jennifer has done an excellent job of simplifying the music and gives 5 different levels to choose from. Now late elementary students can play this piece and it will grow with them until they are able to play Beethoven’s masterpiece. Bravo! Thank you! This piece is such a motivator to my students and can really surprise them when they can play “real” music sooner than they expected, giving them a boost and hunger to do more. Putting complete resources together in one place makes life easier for busy teachers instead of sorting through the various simplified versions published and the educational resources are a real plus. I definitely fell like she “gets” what I need for my style of teaching. I had several younger students asking to play another arrangement of Fur Elise this year. This set is wonderful because they can start at one and when they master it, they can add the next level one and master a bit more etc. Yet each still sounds like the real deal. This will be great.